Antico borgo de’ frati is a tourist home placed in the countryside in close proximity of San Gimignano, where it is possible to lease his wonderful 5 flats per weeks, for spending a magnificent and relaxing holiday with the family or with your friends in the heart of Tuscany, surrounded by the green and the history. Enchanting rural built up area of ancient structure, that in the ancient times turned out to be the parsonage of the Augustinian hermits’ convent, located in a unique position with view on the San Gimignano’s towers, city that is become Unesco heritage. It presents a structure in stonework and bricks with openings mainly staggered, typical of the Tuscan countryside structures, unique in their kind and enchanting with her many views on landscape glimpses unique in their kind. At its side you can find an ancient wood oven for exclusive use of the guests, perfectly functioning, for preparing roasted meals, pizzas, cakes, and a nice and large shared barbecue for fantastic Tuscan mixed grills. In front of the structure there is a little olive trees park with a wonderful and enchanting view on the San Gimignano’s towers, where you can spend time in the open air with all the family or enjoy the sun warmth in relax. Near of it there is also an equipped area for children. 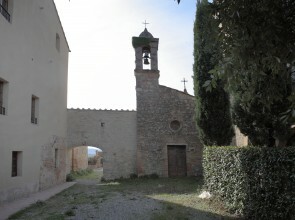 The village is near the Via Francigena (about 2 kilometres) and near the archeological area of Castelvecchio. The structure is renovated with care but maintaining the original setting in order to valorize a building with a great historic importance: in effect the first walls dated XIII century are still visible. The whole compound is protected by the Superintendence for the cultural heritage and by the landscape protection. Composed of 5 flats with staggered floors seated at the bottom of one of the most famous tourist attractions in the world: San Gimignano.